Borrowers had a bit of an easier time getting a loan in March, especially those looking for Jumbo products. 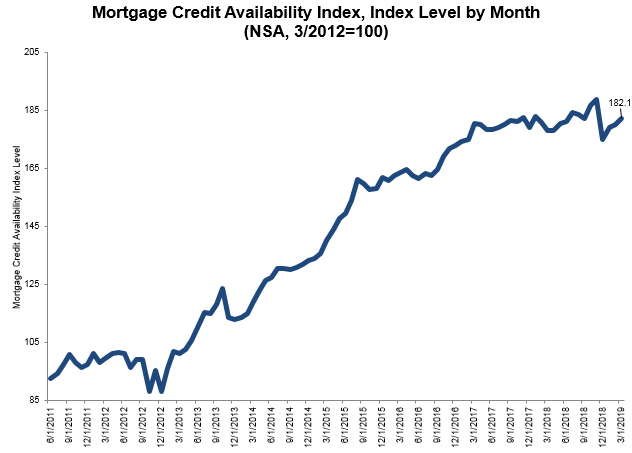 The Mortgage Bankers Association's (MBA's) Mortgage Credit Availability Index (MCAI) rose 1.1 percent from February to a reading of 182.1. A decline in the index indicates that lending standards are tightening while an increase means a loosening of credit. The Total MCAI has component indices representing various loan types. The Conventional MCAI increased 3.6 percent while the Government version was down 1.2 percent. The two sub-indices within the Conventional MCAI both moved higher. The Jumbo index increased 5.2 percent and the Conforming MCAI was up 1.4 percent. Joel Kan, MBA's Associate Vice President of Economic and Industry Forecasting explained, "Credit availability increased in March, primarily due to a spike in jumbo mortgage offerings. The jumbo sub-index increased 5 percent and reached its highest level since last November, as the recent decline in mortgage rates led to a jump in refinances from borrowers with larger loans. The credit supply for government loans decreased in March, as investors continue to reduce FHA and VA streamline refi offerings." MBA's indices are calculated using several borrower and property qualifying factors including credit score, loan type, loan-to-value ratio, etc., collected from more than 95 lenders. These are combined by MBA using data from an AllRegs product to calculate the MCAIs, a summary measure that indicates the availability of mortgage credit at a point in time. The total index was benchmarked to100 on March 31, 2012 while the other indices were benchmarked on the same date, the Conventional index at 73.5 and the government MCAI at 183.5.